This wellness book introduces an enjoyable and accessible method for providing self-care for our overused hands. 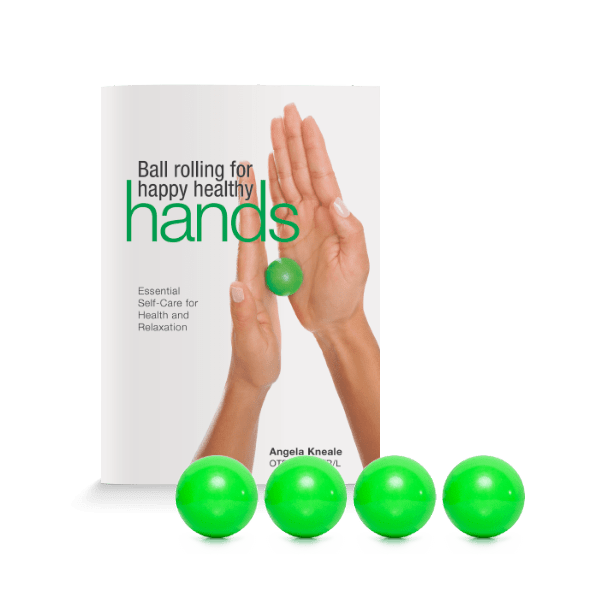 Ball Rolling for Happy, Healthy Hands – Essential Self-Care for Health and Relaxation provides exercises that are designed to rejuvenate and restore the power of our hands, one of our most valuable everyday tools. Readers will discover educational content as well as a comprehensive plan that integrates the use of OPTP’s Small Health Balls™, therapy balls that are ideal for massaging hands, arms, and shoulders to relieve tension and hydrate fascia. Written by occupational therapist Angela Kneale, OTD, MA, OTR/L, NBC-HWC. *Exercises in this book are designed for use with the Small Health Balls. To purchase book and balls as a package set, choose this option from the dropdown menu. With long work-days spent at the computer keyboard, and long after-hours spent working on crochet projects, my hands HURT. I particularly had pain in my left yarn-holding hand, which had been quite alarming for the way it had impacted my ability to crochet comfortably, or even crochet at all. In the past I have tried acupuncture for the pain, which did help, but the pain returned after I resumed my previous level of daily crocheting. THANKFULLY, the holistic approach in Ball Rolling For Happy Healthy Hands has turned out to be exactly the self-care guide I have been looking for. I started with ball-rolling for my painful left hand, following the instructions in the book for the Palm Roll & Release. Then I added on the Thumb Roll & Release because it is this specific area of my hand that hurts the most while crocheting. Lastly, the Web Space Roll & Release rounds out a trifecta of ball-rolling exercises that have managed and relieved my hand pain from repetitive crocheting. I now make ball-rolling a part of my daily life. Whether in the office doing Tabletop Rolling to de-stress and give my hands a healthy break from the keyboard (I even gave the book and balls to my manager, and recommended tabletop rolling to de-stress rather than using his fidget-spinner), or at home crocheting, this book has been enlightening about the whole-body uses for ball-rolling. I am very happy to have discovered this book and little green balls which are making such a difference in the quality of my life. I am now kind of addicted to tabletop ball rolling ! 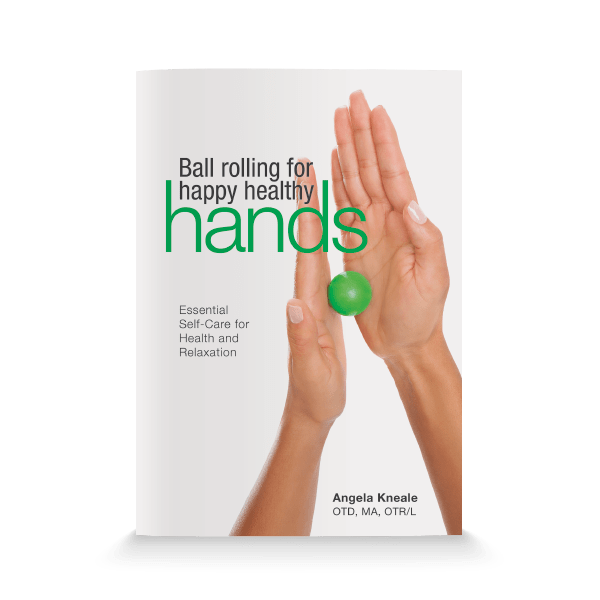 Angela Kneale&apos;s awareness of the mind-body connection and knowledge of the importance of the interconnectedness of all body parts makes the information in this book, Ball Rolling for Happy, Healthy Hands, invaluable. No body is able to be at it&apos;s optimal health without working with the mind and body from this important perspective. Rolling with the Small Health Balls was an invaluable part of recovering from my fractured wrist. I received this book along with the small health balls before my fracture. After my cast was removed the pain was comparable to the actual fracture. Experiencing little relief after the first week after the cast was off, I decided to read this book while rolling the small health balls gently from my palm to my elbow against a table and also rolled the top of my forearm and wrist with pressure from my other hand. The exercises in this book are encompassing for the upper body, but I also learned to hold the ball with light pressure in "stuck" areas while performing my physical therapy exercises. I credit these little balls to the speed of my recovery, allowing me to cut my physical therapy appointments to half of the recommended amount. I&apos;ve told friends and these amazing little balls and have given a couple away for my friends to work on their forearms and calves! The book is an easy, fun read and is recommended for anyone with a body. Everyone&apos;s tissues need releasing, and these balls work beyond muscles, stimulating healing to tendons, ligaments, fascia and promoting healthy nerves and blood flow. I recommend buying the book together with the Small Health Balls. This book is a great comprehensive resource. Not only does it include a variety of movements for hand and upper body, but includes basic anatomy and physiology of hands, and very helpful photographs and drawings to guide in placement and movement. In addition, there are highlights on overall health and wellness – breathing, alignment, and reminders on getting movement many times a day no matter where we are. (And the balls will easily stash on a work desk or in a travel bag.) I’ve found that the balls are useful for more than hands and upper body, and have used them for feet and legs, too. And, you can double your benefit in the time you spend attending to more than one body part when you use a ball between hand and foot or hand and leg. Make sure to get both book and small health balls.